Did Ed Miliband, speaking at the 2013 Labour Party Conference, actually believe his promise to freeze the price of electricity and gas would help anybody other than himself and his electoral (and leadership) prospects? David Cameron during Prime Minister’s Questions on 17th October 2012 shortly before lunch (thus presumed sober). 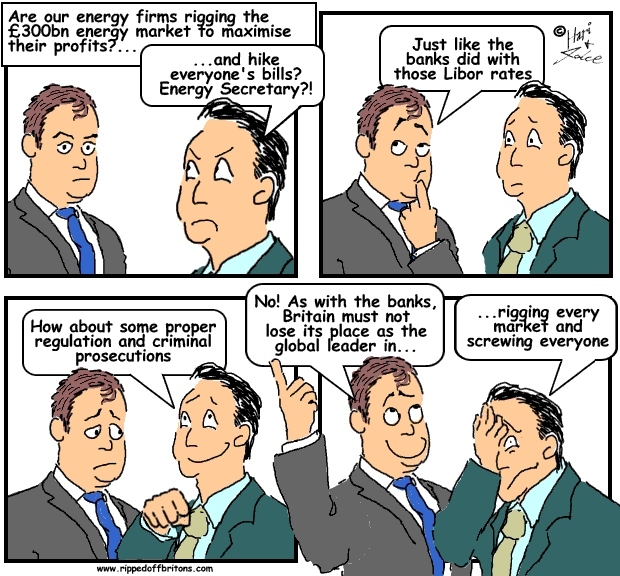 Cameron never did legislate as he had so clearly promised. And with Miliband giving the energy companies over a year's notice to pump up the price in preparation for any price freeze, he won't either. After all, Miliband didn't promise to lower the price, just to freeze it. "we showed a profit margin of just 1.5 per cent from supplying energy. That’s lower than many other essential services, like supermarkets or mobile phones, for example." And he is right! Retail energy companies say their profit margins are so low because they have to pay a high price for the energy they buy wholesale to sell to us retail. They scuttle over the fact that the gouging wholesalers they complain about are in fact themselves. 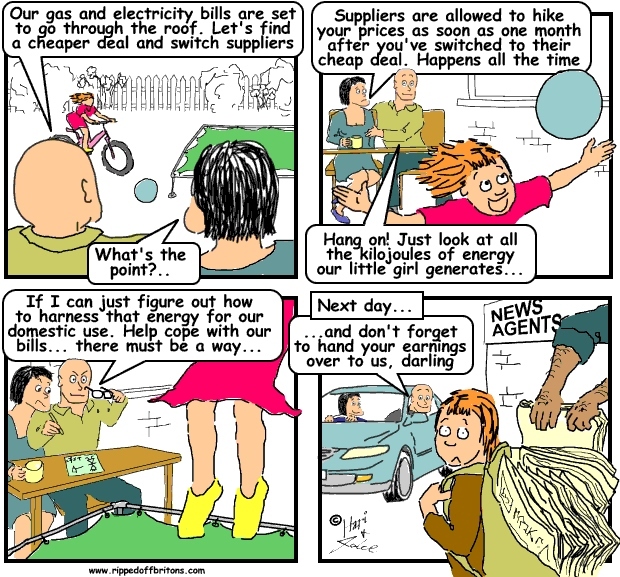 The companies that provide the wholesale electricity and gas are the retailers’ own conjoined twins. Each of the ‘big six’ are now able to supply virtually all their own needs. Energy companies can pull this scam off because they are permitted to be 'vertically integrated' - i.e. they own both the wholesale and the retail businesses. The graph below, from an OFGEM report, shows how from 2005 energy companies shifted the profits from the Retail to the Wholesale end of their businesses, by putting up the wholesale price they make them pay to themselves. This allows them to claim their profit margins are puny when selling to their customers. 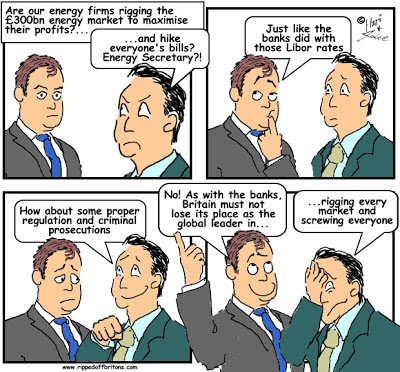 The Parliamentary Committee on Energy & Climate Change reported in July 2013 that while energy companies could claim a measly 1.5% profit margin on supplying domestic electricity, this was covering up a more than 20% profit margin taken by the wholesale generating end of these same companies. 1) Are we running out of oil and gas? ...three technological revolutions [drive this]. US shale oil is one of them, but it has been preceded by the technological revolutions facilitating the tapping into vast hitherto non-commercial resources in deepwater and shale plays." "Consider North Sea oil, for example. When it was developed in the 1970s, it seemed that offshore technology had reached its most daunting frontier, tapping fields that lay below 100 to 200 meters of water and 1,000 meters under the seabed. The cost of operating in those conditions seemed to be prohibitive, and only the two oil shocks of the 1970s and the consequent spikes in oil price made North Sea oil profitable. Yet after ten years of intense exploration, development, and developing infrastructure, the cost of discovering and developing North Sea oil has decreased by 50 percent. Today, the oil industry can strike oil below 3,000 meters of water and 6,000 meters of rock and salt; the limits of the North Sea in the 1970s are business as usual today. There is a learning curve for new technology, but the difficult oil of today will be the easy oil of tomorrow." The US Government's Energy Information Administration (EIA) provides figures on proven oil and gas reserves. "Proven" means reserves with a 90-95% certainty of being possible to produce (i.e. excludes oil & gas considered more difficult to extract). Far from running out, both show extraordinary growth. 2) Is global demand outstripping supply? Technology and energy efficiency have consistently reduced the oil input for each unit of GDP. Each prolonged period of expensive oil (like the one we have experienced so far since the beginning of the 2000s) led to an increase in efficiency (due to specific legislation and improved technology), that will reduce the specific consumption of oil for each dollar of wealth created. The statistics of future demographic trends always seem to feature sustained growth. In reality, developed countries have fewer children and a lower specific consumption of energy for each unit of wealth created, because they can take advantage of new technology and more efficient energy systems. In their turn, developing countries could utilize those technologies and systems to lower the growth of their energy demand. Of course all this plentiful supply of oil and gas will come as no consolation to those worried about global warming. But the solution to global warming is not ripping off consumers, nor boosting energy company profits. On the contrary, so long as selling oil and gas provides bumper profits, these companies will drag their feet on new green energy. If our next Prime Minister, whoever it may be, really wants to do something about gouging energy prices then they shouldn't start by controlling retail prices. And making it easier for people to switch suppliers in the current environment is also a sham. It is no better than telling a man chased by a pack of wolves he has the right to choose which one can bite him. A genuinely free and transparent market is the best mechanism to stop the rip-off. So the next Prime Minister must first separate the generating companies from the retail companies.